As I read about the horrific train crash in Philadelphia, it occurred to me that many of the issues concerning the operation, safety and reportage of different kinds of transportation accidents overlap. Here was a very serious accident which resulted in a tragic loss of life, major equipment damage and serious disruption of operations due to an apparent operator error. As with all accidents of this magnitude, investigative agencies will be do their best to reconstruct the events and to determine the causal factors which led to the accident. Reports will be filed, suggestions will be offered for safety improvements and blame will be laid. Politics, as per usual, will also intrude and indeed already has. One of the frustrations of the public concerning dramatic accidents such as this is that official investigations seem to take forever. In the meantime there is a palpable need to determine cause which popular media outlets are only too happy to fulfill. Hardly a day had gone past before it was reported that the train had entered a sharp curve at nearly twice the posted speed limit of 55 miles per hour. It at first appears as if this is an open and shut case of egregious malfeasance on the part of the train driver. That may be true, but I found myself thinking that this conclusion was simply too easy. There may be more to the story. Make no mistake, it certainly sounds like 32 year old Brandon Bostian, the train's engineer and an admitted train enthusiast with a good record, was grossly incompetent in taking the turn at such a high rate of speed but it should also be noted that Mr. Bostian certainly didn't come to work that day with the intent of crashing his train and killing half a dozen of his passengers. The challenge before the investigation board will be to go beyond the obvious reason of excessive speed to find out why Bostian was travelling so fast and why he didn't brake until too late. It may be a simple case of distraction or perhaps he just dozed off. This accident also highlights the fallible nature of human beings when they have the potential to be a single point of failure in a control loop, as highlighted by this and the recent Germanwings disaster. A question that I immediately had was that even though the speed limit of that particular curve was posted at 55 MPH, I wondered how closely those limits are adhered to by most engineers. We all know that in certain realms of life there might be a "book" way of operating and a "real world" way which may be quite different. Let me explain. We all drive on the freeway, and while exiting we all see the "Exit" sign pointing towards the ramp which usually has a speed limit for the ramp. And we all dutifully ignore that limit. A ramp posted at 25 MPH (as many are) can many times be easily be negotiated at 40 and perhaps even 50 if you took your wife's BMW to work that day. And when was the last time you saw a cop pull someone over for speeding around an exit ramp? Occasionally we encounter a ramp which is truly a tight curve where the posted limit is for real. In these cases we end up jumping on the brake and becoming annoyed that we had no warning. Should you then hit the guardrail, that excuse will hold no water with the insurance company. I would hope that in this case the investigators check the black boxes of other trains on the same route to determine at what speed most engineers take that curve. They might be surprised. Perhaps it was "known" among the ranks that the curve is normally taken at 100 with no ill effects. Every operational organization I've ever been a member of has had a "culture" which recognizes that there is the "book" or "schoolhouse" way of operating and the "real" way. And by that statement I don't mean that everyone is running around breaking all the rules but rather that there is some variance between how the books are written and interpretations due to the necessities of real world operations. In fact, when some unions wish to conduct a work slowdown in the course of labor negotiations, they conduct what is know as a "work to rules" campaign by strictly following every last picayune directive in their operating manuals. This can easily bring any manufacturing or transportation operation to its knees and is actually recognized by many courts as an illegal work stoppage which I find humorously ironic. Have an accident or incident as an operator, though, and you can be sure that the full weight of the rulebook will be used as a witness for the prosecution as seems to be happening here. Had the train derailed going 56 MPH, the engineer is still completely at fault. The problem is when "real world" operations get too far away from what the book says. No one may know what the true safe speed is and if someone made the curve at 90 yesterday and nothing bad happened, why not try 100 today? You can easily see that this is an unacceptable method of operation. Perhaps a solution to this dilemma would be an effort to write more realistic operations manuals. Other questions which should be asked are whether there are penalties for being late or incentives for being early. It should be asked if this train was running on time. In airline operations, it is well known that many errors result as a consequence of rushing through checklists. Most airlines' official stance is to not apply any undue pressure on pilots for an ontime operation. Gate agents, however, are under tremendous pressure to get flights out on time on pain of punitive action up to and including their employment. Threaten someone's livelihood and you get their attention quickly. I often get asked to release the parking brake while still at the gate which will show an ontime departure on our automated reporting system, but surely it is easy to see how policies like this can cause mischief. These three perennial bugaboos plague all modes of transportation and seem to never find a solution. The simple reason for this is that they are design defects in the standard issue human. Until humans are completely separated from transportation systems, these problems will never be completely solved but only mitigated. Investigators will work to determine how long Bostian had been on duty and what his sleep schedule had been. He has already turned in his phone to authorities who will determine if there had been any activity during the time that the train was in motion. 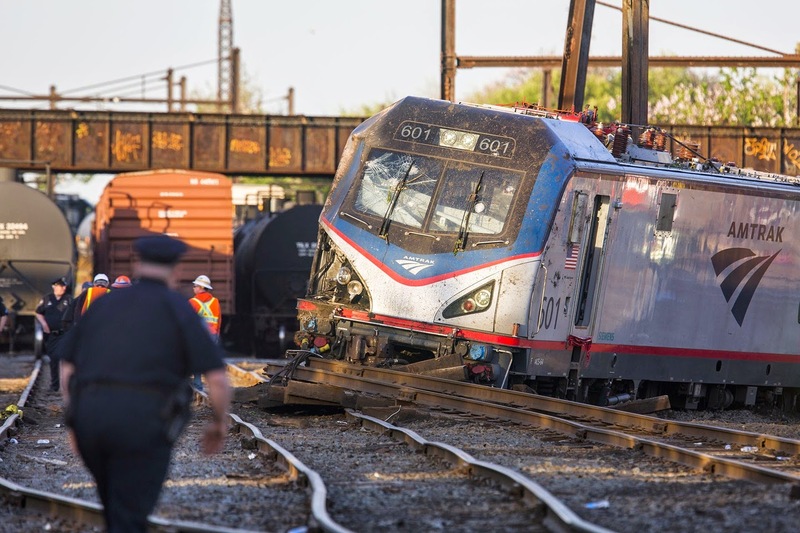 A train crash in California was attributed to a texting engineer a few years ago. I used to love to ride motorcycles and would love to someday get another one, but won't as long as the cell phone exists. Distracted drivers are a real threat to everyone on the road. Bostian has reported that he remembers nothing just prior to the crash. While it may be a defense, he may have dozed off or was suffering from a "micro-sleep". Fatigue, which used to be characterized as a moral failing, is finally being recognized as a physiological debilitation with real world consequences for persons in safety critical jobs. The Wall Street Journal has reported that the train accelerated from 70 to 110 MPH in the 60 seconds before the crash. That could plausibly be attributed to Bostian just dozing for a few seconds. The FAA recently completely overhauled the rest regulations for pilots. While still flawed, this overhaul at least telegraphs a recognizance of the problem facing operators. I want to close this essay with a note about the news coverage of the accident. As per usual, a high profile accident like this will grab the headlines for one or two news cycles. There is nothing new about the old tag line of if it bleeds, it leads. Typically, a few snippets of information will leak out followed by many furrowed brow talking heads being ordered to fill hours of airtime with speculation. The result will predictably be calls for a murder indictment of the engineer before all the circumstances of the accident are known. Accident investigators are put under tremendous pressure to report a cause quickly which certainly can not help their efforts to understand the underlying causes and possible remedies for a tragedy such as this. For some reason, my Timex consistently showed an on-time "push". Of course, this was before they tied that silly ACARS into the parking brake switch.